2When the tool is enabled on a web page, a sidebar appears on the right side of the screen. The first icon, an arrow, opens the menu. By clicking on this, you will access all the tool’s features. Click again on the arrow to minimize the menu. The second icon (an eye) hides the highlights that appear in the text when annotations are made. The third icon is used to create a page note (or an annotation if a passage of text is selected beforehand). Once the menu is open, three main blocks appear. 5This first block contains the different annotation layers enabled on the web page. In the example above, we are in the “Public” layer on Hypothes.is. But you can also create and select private groups. 6Be careful – there are several layers of annotation and it is important to check that you have selected the correct one. 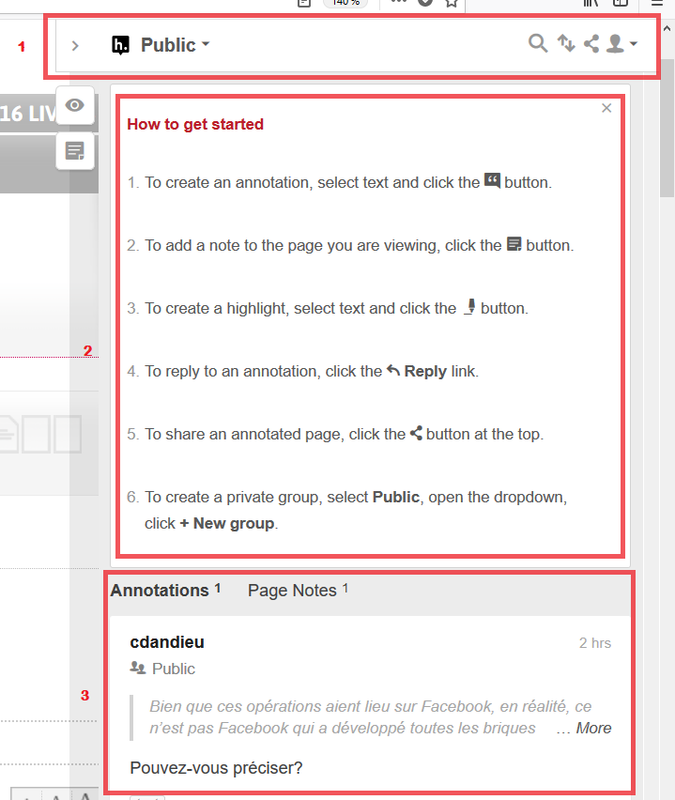 To select the annotation groups, click in the drop-down menu. 7If the book that you wish to annotate is taking part in the open peer review experiment, it is necessary to select the “OPR” group of the publisher that published this book. For example, if the chapter to be annotated is published by OpenEdition Press, select “OPR OpenEdition Press”. 8Annotations made outside of the experiment must be written in the “Public” group on Hypothes.is. Magnifying glass: search among the annotations. Double arrows: sort the display order of the annotations. Sharing: share the web page. Profile/connection: if the user is not connected, they can do so here. If the user is already logged on, they can access their user page on the Hypothes.is website. 11These are the Hypothes.is instructions. If they bother you, you can hide them by clicking on the cross in the top right of the block. 13This contains the list of annotations and page notes. The superscript shows the number of annotations and notes that have been published. Click on “Annotations” to make the annotations appear and click on “Page notes” to make the notes appear. 14Users must have an account to be able to annotate. To create a user account, simply go to this link: https://hypothes.is/​signup. Fill in the three fields requested and accept the conditions of use. Hypothes.is then sends an email to activate the new account. Go to the web page you wish to annotate. Open the drop-down menu (click on the arrow icon in the sidebar). Click on “Log In”, enter your username and password and validate. 16Once the identification is successful (the “Profile” icon appears), you can start annotating. Select the passage of the text to annotate by “clicking and dragging” it. When a piece of text is selected, two icons appear. The one on the right, “Highlight”, allows highlighting (this action is only visible in private mode). The one on the left, “Annotate”, allows you to create an annotation. Click on it. Once you click, the annotation editor opens. 17Enter the content of the annotation in the text block. This text can be edited thanks to several icons which allow you (in the order of the display options) to: write in bold; write in italics; insert a quote; insert a link; insert an image; insert a mathematical formula; insert a numbered list; insert a bullet list. The “Preview” function allows you to view an annotation before publishing it. 18It is also possible to add keywords (tags) in the “Add tags ...” field. These are optional but may be useful for managing annotations on the Hypothes.is site. In the previous example, the keyword “test” has been added to an annotation. To do this, we entered the word “test” and pressed the “Enter” key on the keyboard. Once the keyword is added, it appears as a label under the annotation. You can add multiple keywords. 19The last step, which is required to validate an annotation, is to click on the “Post to ...” button. If you do not perform this action, the annotation will not be published. 20Finally, the icons that appear at the bottom right of a published annotation allow you to perform several actions: edit; remove; reply; share. 21To respond to an annotation, click on the arrow icon (bottom right of a published annotation). A new text editor block opens. As with a standard annotation, you should: fill in the text, add keywords if necessary and click on “Post to ...” to publish. 22Users are notified by email when they receive a response. 23To edit an annotation, click on the pencil icon (bottom right of your annotation). The text editor block opens. Edit the text, then click on the “Post to ...” button to save the change. 24To delete an annotation, click on the trash can icon and confirm the deletion. 25Each annotation has its own URL. To share an annotation, click on the last icon at the bottom right of the annotation (or the second to last if it is not your annotation). You can then share it on any of the following by clicking on the associated icons: Twitter; Facebook; Google+; email. You can also copy and paste the URL of your annotation. If a user opens the URL of an annotation, they will be taken to the passage of annotated text (and the annotation will open automatically). 26On Hypothes.is, annotations may be moderated. If an annotation seems inappropriate, just flag it by clicking on the flag icon at the bottom right of the annotation. Moderators will then be notified of the report and may hide the annotation if they consider that it does not comply with the code of conduct. 27Annotations allow you to write a comment relating to a particular passage in the text. But it is also possible to make an overall comment on the chapter or book you are annotating by using the “Page notes” feature. 28To do this, click on the document-shaped “New page note” icon in the vertical bar of the drop-down menu. The text editor appears. The procedure is the same as for publishing an annotation. 29Users have a personal space, which is accessible on the Hypothes.is website. To access it, click on the “Profile” icon (top right of the menu) and then on the username. The user page opens in a new tab. It lists all annotations made by the user. It is possible to sort these annotations using the associated keywords. 30In addition, you can consult other annotators’ pages by clicking on their pseudonyms (only the public annotations will be visible). Author: public annotations made by a user. Keyword: Annotations labelled with the keyword you are looking for. Group: Annotations created as part of a private group (if you are part of it) or an open group. URL: Annotations made on a particular web page.